With the release of the Rubicon expansion, CCP Games introduced Ghost Sites – pirate faction combat sites that include research facilities for the development of Star Gate technology. This technology could make the development of advanced Star Gates possible. These advanced gates could transport pilots to other star clusters or galaxies, opening a “New World” of unexplored territory to capsuleers. The exact nature of the components required to build a Star Gate, and how they might work, is as yet completely unknown. But there have been enough hints provided to know that key components will be found in dangerous Ghost Sites. Capsuleers will have to retrieve them, and experiment with them, in order to learn how a Star Gate may be constructed. In order to accelerate the development of Star Gate technology, EVE University is launching Project Ascension. It has established a section for the free sharing of information about Star Gate and related components on its UniWiki resource: http://wiki.eveuniversity.org/Project_Ascension. E-UNI will also make available a dedicated discussion area, open to the public, in its forums: http://forum.eveuniversity.org/viewforum.php?f=252. Additional resources will be provided by E-UNI to support experimentation with Star Gate components, as required. All pilots who learn anything about Ghost Sites and any components discovered there are urged to participate in Project Ascension by posting their findings on the wiki, and sharing their observations on the dedicated forum. You may be wondering why we started this project. Frankly, I would love to see the development of these advanced Star Gates as soon as possible. The opportunity to explore and lay claim to brand new space appeals to me a great deal. I'm sure it also appeals to some of the larger alliances and power blocs, too. Probably, it appeals a lot. I suspect that those groups will be less open to sharing whatever they learn from Ghost Sites, putting other players at a disadvantage. With Project Ascension, I hope that we will encourage free exchange of information, so that multiple Star Gates may be constructed, allowing more opportunity for all capsuleers to enjoy the new territory, when it becomes available. I may be fooling myself here, and this project may fall down completely. But I hope not. I intend to promote this initiative, and solicit the help of any corporation who wishes to participate in this open exchange. Will the UNI build one of these advanced Star Gates? Highly unlikely. But we'll be happy to help do so as part of a coalition of interested parties, if that is feasible. We would require that if successful, that gate would be available to all pilots, not just a select few. But that is a long way off. 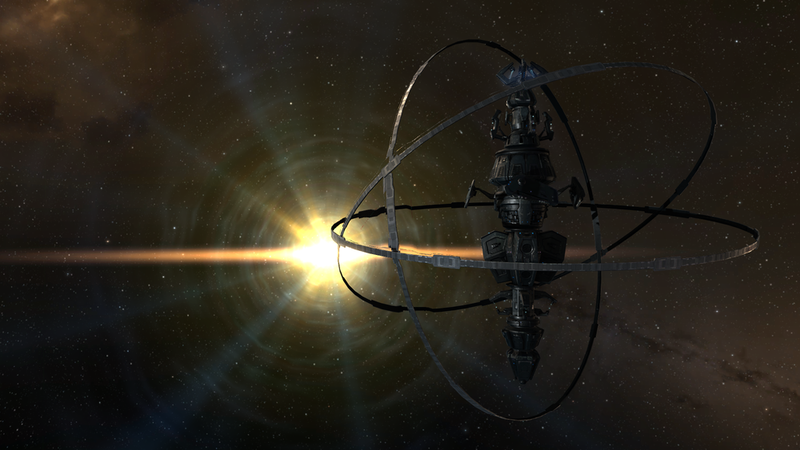 For now, let's see how many pilots are interested in helping to figure out this new puzzle in EVE Online. If that appeals to you, come join us! Posted in News and tagged with EVE Online, Project Ascension, Ghost Sites, Star Gates. November 21, 2013 by Neville Smit. CCP Affinity posted a dev blog about Ghost Sites coming in the Rubicon expansion, and my excitement level just jumped up a couple of notches on my EVE-O-meter. My initial reaction to the various features of Rubicon, to be released on November 19th, was: "I like it, but it seems light." I subsequently wrote about the lack of any substantial new content, and expressed my concern that Rubicon was going to be yet another disappointing update, resulting in lower average daily log-in counts. I'm not worried about this now. Rubicon is going to be very popular. These are going to be a new player-vs-environment (PvE) experience. Unlike regular mission sites or exploration sites, ghost sites are going to be an interesting combination of the best parts of each. They are pirate faction anomalies that will crop up in all parts of space. If you're lucky enough to come across one, it'll automatically appear on your system scanner. The moment that the first player enters a Ghost Site, an invisible and random timer will start ticking. You will never know how long until the traps laid by the pirates might explode, shredding your bulkheads and leaving you adrift in your pod. Your objective, if you wish to risk life and limb (well ... your crew's lives and limbs) is to hack your way into the sites 4 research facilities, grab whatever you find, and get out as fast as you can. At the moment, hacking is only found in exploration-style environments, so we decided it would be fun to shake that up and see how it works under pressure-cooker circumstances. You will only have one chance to hack, if you fail you will set off the containers security and they will explode. While Ghost Sites are not exploration sites, you'll still need to use either a data or relic analyzer to access the vaults. If you're successful in hacking, you'll be given loot (which won't be scattered), but if you take too long, the pirates will be alerted to your presence and will warp in to attack you. The pirates are there just to protect their loot and will not be carrying any items in their cargo or have a bounty on their heads. As I mentioned, these sites are related to dangerous experiments, and the pirates desperately do not want the capsuleers to steal the fruit of their labors. When they realize that they have an intruder in their midst, they will blow up the research facilities, causing damage to everyone in the vicinity. I love this idea - it offers higher reward for higher risk. And it will require a combination of skills to complete successfully, with significant consequences for failure. The fact that these sites will appear everywhere, including wormhole space, is also smart. Adding some higher risk elements to high-sec, if players want to try them, provides more options for play at different levels of risk, without having to go into more dangerous space. This is balanced by improved loot in higher-risk space. Perfect. The only thing that concerns me is that they are described as "rare" - so, when they do appear, there will probably be a crazy mad rush of every pilot in system. On the other hand, that might not be such a bad thing, since the sites are timed, so having several pilots hacking away at once might be desirable. But if any one of them fail, and the whole thing goes boom... that could get interesting really fast. I admit, I enjoy the backstory of EVE Online, and I'm really pleased to see CCP take the time to integrate these ghost sites into the lore of the game. If it's done well, it will add another layer of flavor and rationale about why these new sites exist, and how they connect to future events. Call me crazy if you will, but I like things to make sense in EVE Online. I know there are a lot of players who dismiss the game's lore as fluff, and generally ignore it, but I think they are missing out on a great story. Kudos to CCP for keeping this aspect in mind. I admit I despise the scattering spew mechanic of the Odyssey hacking sites. It does require more interaction, which is good, but it's also highly annoying, especially when you get lousy loot for your troubles. The fact that this mechanic is being dropped from hacking in ghost sites makes me smile. They sound dangerous enough without having to click on a diaspora of cans anyway. And the loot is going to make these sites worth the risk, it appears. With the first ever blueprints for implants, as well as for new mobile depots outside of high-sec, ghost sites should give pilots enough incentive to risk destruction. The new Ascendancy implants, with their improvement on warp speeds, are going to be very much in demand, as Rubicon's changes to warp mechanics makes this much more important. I also find it funny that one of the mobile depots are called "Yurt", because that is exactly what it looks like. Mobile Player Depot - the "space yurt"
Clearly, CCP Games reads all of my blog posts and puts great stock in my sage advice. It's the only logical explanation. I'm sure my Ishukone Scorpion will be delivered any moment now, since I'm obviously so prescient and awesome. Please post your thanks and accolades in the comments. All gifts of gratitude are welcome, of course. Posted in Commentary and tagged with EVE Online, Rubicon, Ghost Sites, PvE.